Love the blanket. I am just learning to knit so I am doing an all garter stitch blanket. I love the garter stitch. Knit 1 Purl 1 will be my next project. thanks I was wondering what to do next. Hi Bunnita! I’m sorry it took me forever to respond back to you! I hope your knitting is going well! How many stitches did you cast on? What is the length and width of the blanket? Do you think a non wool yarn would work? It has been a long time since I knitted anything, I feel like I need to start with something simple. I used size 6 (US), 24 inch circular needle from Addi Turbo, and started with 130 stitches. I love Addi Turbo needles — they really speed up your knitting! The finished blanket measured about 34 in x 50 in after blocking. I think this is a perfect blanket if you’re just getting back to the knitting saddle! It’s simply enough that you don’t have to pull your hair out and is still beautiful! I think a non-wool yarn would work. 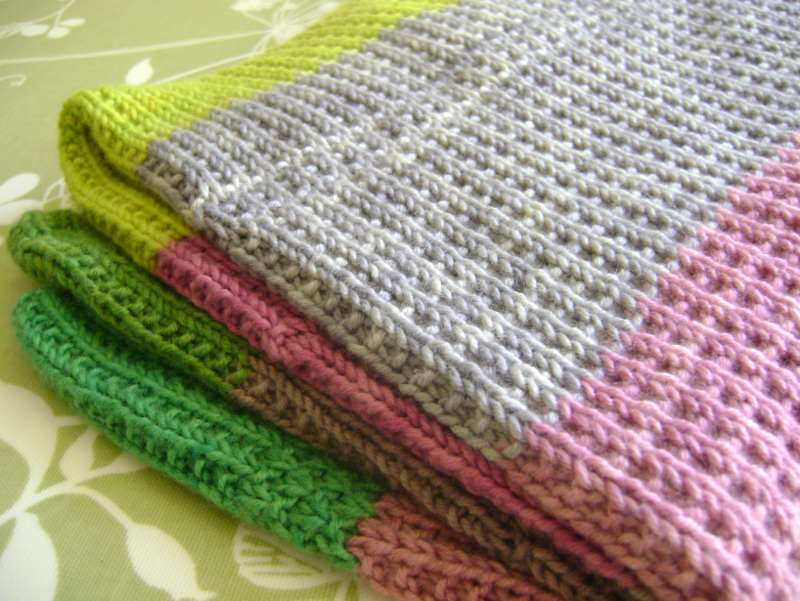 I’ve knitted a blanket before with yarns that weren’t wool and it came out fine. I still like working with wools because of the softness. And the stitches come out more defined after you block it. Good luck with your project and please let me know how it turns out! I used size 6 (US), 24 inch circular needle from Addi Turbo, and started with 130 stitches. The finished blanket measured about 34 in x 50 in. I knit pretty loosely, and it stretched a lot when I blocked it. I wrote this on the above post but the color runs on the Alchemy yarns so I recommend that you use bright colors and avoid white. Thanks for the variation! I’m just about to start that same pattern, but was just so-so about garter stitch, so will use your lovely variation instead! Hi Gia! Thanks for the comment! I totally hear you about the garter stitch. I’m not a huge fan either! The stitch I used for the blanket provides unique textures on both sides, which makes it fun. My one year old loves it so I’m happy! Good luck with your blanket and let me know how it turns out! Is your blanket folded in all the pics? It looks very thick. Or Did you connect the round on the circular needles and make it a tube?? Thanks! Hi Arjan! Thanks for stopping by! Yes, the blanket you see are folded into two. The finished product is much larger, at about 34 in x 50 in, and not as thick. Check out the below posts to see the actual size and thickness. I used the Turbo Addi circular needle but I didn’t connect the piece — so it’s not a tube. Most regular knitting needles are too short to hold 130 stitches so I used the circular one. I hope this clarifies! Happy knitting! Please let me know if you have any questions! I just let each skein of yarn run out on each block. Each stripe came out pretty evenly although not perfectly the same, at about 8-9 inches after blocking. I LOVE THIS! Thank you so much for sharing – I get SO bored when I knit so I have to have more than one project going at a time – ESPECIALLY with big projects like blankets, etc. I’ll be making a few of these! Thank you, Bobbi Lynn, for the sweet comment! I get pretty bored with the same stitch too! I think the stitches used here are easy enough that you don’t have to count, but interesting enough to keep going. Let me know how it turns out! Happy knitting! I am making your blanket for my soon to be born baby girl. And…was wandering – does it look the same on the other side? Mine doesn’t and I just wanted to be sure that I do it right. I’m so delighted to hear that you’re knitting the blanket! And congratulations on your pregnancy! What an amazing time, waiting for the arrival of your baby! I hope all is going well for you! Below is the photos of the blanket. It’s not the same one you see on this blog post but the pattern is the same! Thank you I have just knit two of these purl bee blankets and I love them but wanted something slightly different for my third attempt. I was going to do seed stitch but I keep messing it up so this is perfect! Hi Meg! Thanks for visiting my blog and leaving a comment! I gave admired this blanket of yours for a few years now. I’ve saved the picture and when my husband & I found out we’re expecting our second child (a girl:) I knew immediately, I would be knitting this blanket! I love the colours you used and love the pattern. Like you I am not a fan of garter. I really appreciated the pictures you posted above showing the front and back. Could you please tell me how you prevented the two-colored stitches when you added the new yarn colour? I have tried several different techniques and can’t seem to avoid that. Hi Seana! Sorry for the delay in responding to your comment! I’m so glad you like the blanket and congratulations on your pregnancy! Aaah, a girl! When are you due? What an exciting time for you and your husband! So happy for you! For the color transition, I usually change the yarn on the right side so that the transition doesn’t show up on the front (and the most visible side). I think it’s inevitable that stitches will show on the wrong side but it’s less obvious when it’s on the wrong side. Does this make sense? Again, congrats and happy knitting! 🙂 Thanks for the comment and visiting the blog! If I wanted to make this blanket bigger in size, what are the increments in which I increase? Thank you so much for sharing in my joy! I am due in May. I guess I must be doing this correctly b/c that is how my blanket is looking, so I’m so glad to have your pictures as reference. I love your blog and am so excited to finish this project! Thanks for posting this! I’m using the Merino Script yarn from Purl Soho and wasn’t too keen on garter stitch as well. After knitting for a few nights my blanket is now 5″ long (I’m making an adult blanket) and I love the look on both sides. However I’m getting curled sides (left and right) and wonder if your blanket is the same? What do you suggest I do to remedy it? Thank you. I’m so sorry that I didn’t respond to your question until now! I’m sure you’re done with your blanket by now, but just in case you’re wondering about the curled sides … I did experienced a slight curl on mine as well. I wasn’t too bad, but I kinda wished I put a few garter stitches at the beginning of each row — maybe about 3-4 stitches — so the blanket will lay flat, but since I didn’t, I made sure that I pinned the blanket down well during the blocking process. I hope your blanket came out wonderful! I used size 6 (US), 24 inch circular needle from Addi Turbo, and started with 130 stitches. Good luck with your baby blanket! I’m sure it’ll come out gorgeous! Please keep me posted! Hi. I love your blanket pattern! 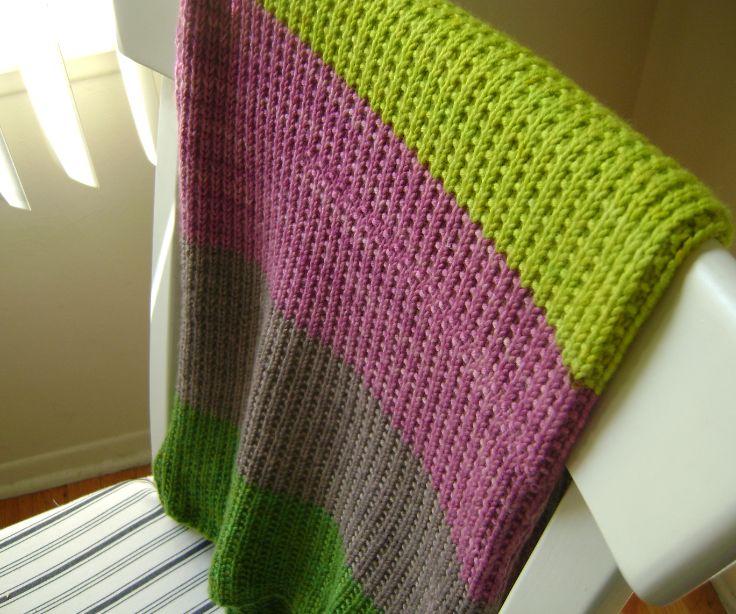 I have already made one blanket in a variegated color yarn. Now I can’t wait to make one like yours with stripes. 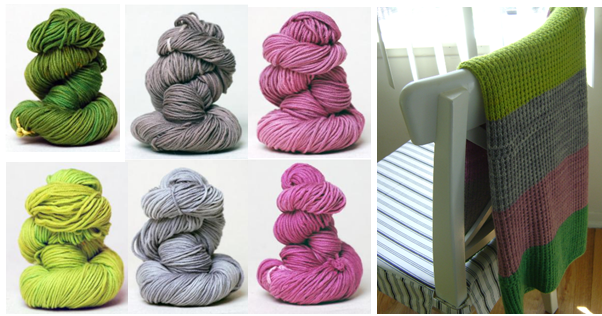 So I was wondering what is the yardage for the skeins of yarn that I need to use? Hi Susan! Thank you for your kind words about the blanket pattern! I used Alchemy Temple (100% superfine marino) and each skein was 50 grams. I used a total of 6 skeins so it was a total of 300 grams of yarn for the project! I hope you enjoy knitting the blanket! Please let me know how it turns out! Hello please let me know if I add a garter border to tackle curling as mentioned in previous comment, then how many rows and stitches should be good on each end. Also in that case should I start and end the pattern with p1 so that it doesn’t mix with the knit stitches of garter border. How many stitches should be good to do a p1 k1 p1 ending in p1. Also should p2 k2 be fine? Taking 130 stitches as mentioned would result in k1 in beginning and p1 in end making the garter border on one side thicker by a knit stitch. If I do a crochet cast on, then how many rows (odd/even) of garter stitch to start the pattern on the right side. Please help me on this asap. I am just waiting for your reply to start with the blanket. Thanks a lot for your time ! Hi there! Thanks for the comment. I think 3-4 garter stitches in the beginning will suffice if you’re just worried about the curling. If you want the garter stitch to become the actual border design, then definitely do more stitches. You should be okay with starting with K1 (after the garter stitch). My recommendation is that you try out the garter stitch and the K2 P2 design that you’re thinking about doing, and see if you like how they look. You don’t have to knit the entire 130 stitches across but maybe even 1/4 of that amount and knit enough rows so that you will actually see wha the stitches will look like. I can suggest numbers, etc. but I shy away from it since I don’t know exactly what they would turn out. I hope this helps. So yeah, try knitting the sample and see if you like it! Thanks a lot ! Did you change color on the K1P1 side or the all knit side? For the color transition, I usually change the yarn on the right side (so that would be the K1P1 side) so that the transition doesn’t show up on the front (and the most visible side). I think it’s inevitable that stitches will show on the wrong side but it’s less obvious when it’s on the wrong side. I posted photos re: the color transition when I responded back to Seanna (on February 10, 2015). If you scroll up a little on the comment section, you will sed them! I hope they help! Let me know how it turns out! I know your blanket will turn out wonderfully! did you do a border on each side?